Free Shipping Included! Excelvan LED Multimedia HD 1080p Projector Up to 20,000 Hours LED Lamp Life for Home Theater by Excelvan at FloType. MPN: 160827-C3. Hurry! Limited time offer. Offer valid only while supplies last. Warm Tips: ❶Not recommended for PPT or business presentation, ideal for home theater, movies and video game use. Please use it in dark environment. ❶Not recommended for PPT or business presentation, ideal for home theater, movies and video game use. Please use it in dark environment. 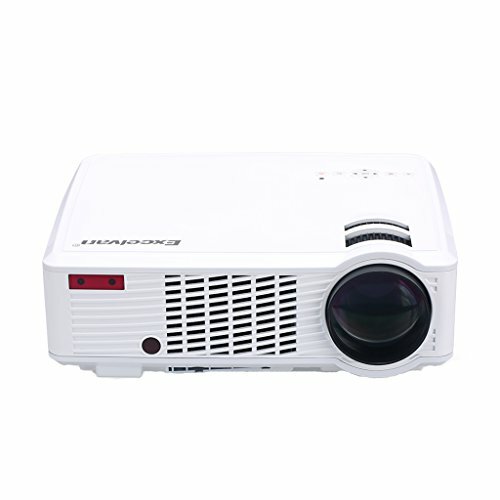 ❷To connect this projector with PC/Laptop for a more clear and smooth image. Please adjust the PC/laptop display resolution to 800x600 or 1024x768. ❸Due to dolby copyright, the projector do not support related audio decoding. ❹Please connect your smartphone or tablet to the projector by MHL cable(Not included). Watch TV by HDMI connecting the TV BOX. ❺When using the remote control, please aim at the IR on the projector. Warranty---All Excelvan projectors have 1 year warranty, 100% satisfaction and zero hassle returns guaranteed. 5" TFT LCD Display---Support 1080P HD, increase transparency and clarity, providing you stunning viewing experience. This video projector has 2600 lumens LED light source, provides fantastic home cinema experience, with Led bulb lifetime up to 20000hrs. Ideal for home entertainment in dark environment such as videos, photos, games. NOT recommended for data presentations, like PowerPoint slides, PDFs, Excel, Text files. Compatible With---HDMI connector, connect with iPhone, iPad(a lightning digital AV adapter is needed which not included), Android samrtphone which support MHL function(a MHL cable is needed). Deliver screen, video, audio, photos on iPad or smartphone to a giant screen, ideal and convenient for small-sized business presentation or home entertainment in dark environment. If connect with Macbook/Macbook Pro, a HDMI adapter(Not included ) for mac will be needed. Multi-interface---Support multimedia function with 2x HDMI, 2x USB, VGA, TV/ ATV, YPBPR input, can be connected with TV, TV box, X-box, PS4, Laptop, PC, USB drive, iPad, Smartphone. 3 projection methods are supported: Front/rear/ceiling. Image can be reversed 360°that means the home projector can be put on the desk or hung on the ceiling. If want to hung the projector on the ceiling, We have a ceiling stand (Not included in the package) available to sell. Energy Saving---Adopt latest LED light source, save energy up to 70%, lifetime up to 20,000 hours. We provide a lifetime free bulb replacement. Within 1.2-4.0m projection distance, you are free to enjoy your favorite movies, thrilling sports match, fashion show, impressive photos in a giant screen display from 32 to 120inch (The recommended projection size is from 60"/ 2.2M to 100"/3.5M). Display 3D movies with red-blue movie source by wearing red-blue 3D glasses (Not active shutter 3D).